Playing?? More like failing!! I was never actually taught how to use watercolors so I am pretty much starting from a very low point to find a way that I like to work in this medium. I figured "if" I can actually pull this off with some success, I would be open to do some color commissions at shows and stuff. A ways off I think. I actually don't currently do any type of commission work but I think that part will change very soon but it will be pencil sketches and maybe inked with shading to start off. What do you think?? I am open to suggestions so don't be shy. Open to suggestions that don't involve me going out to buy a set of markers. Not gonna happen any time soon. I am not ready or even sure if I want to make that huge of a financial commitment. Plus, I have not worked in just over two months so my financial resources are limited. 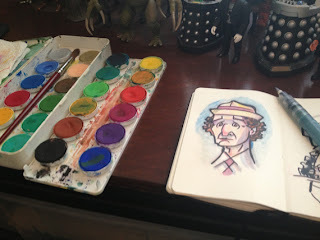 But here are a few shots of my initial forays into sketching with some color. I was going to tease you all by only posting part of the process again and drag it out but I am in a generous mood and decided to sprint to the finish line. Plus I got other things in the hopper that I need to get to. So here it is. Superman!! I like how it came out and I hope you all do as well. 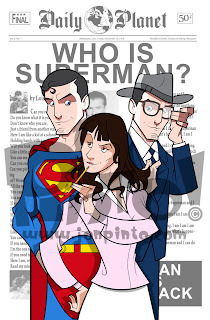 I was nervous drawing and creating this one as Christopher Reeve holds such a special place in my heart. The one sheet hangs right above me now as I type this with the simple tag line: "You'll believe a man can fly." And I did. 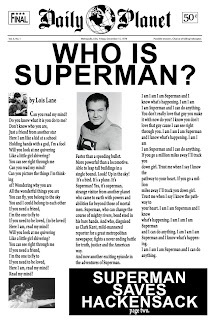 He is still my Superman and I still believe. 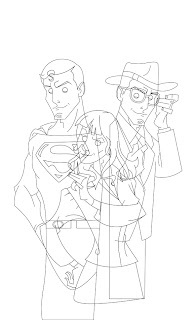 With the inking done, the flat color goes in REAL fast. Just a few clicks really. Once I have this I can cut and paste smart objects into Photoshop and start painting and have nice clean selections to work from. A separate file is made to import into ArtRage so I can paint the flesh areas. Again, I have clean selections so I can paint with abandon and not worry about overspray. I'll show you all one day how I do that if what I said makes no sense. 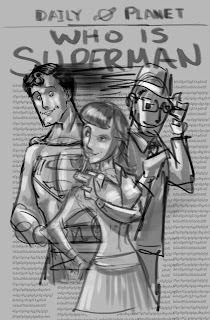 Work is moving along smoothly on my Superman picture. 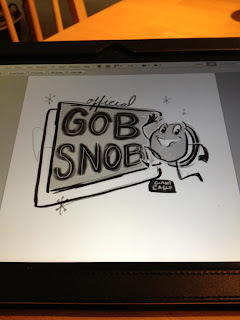 The inking stage is done and it is all ready for color. 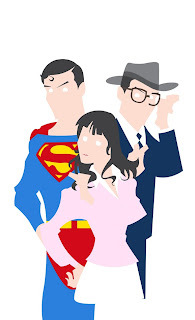 I also have to make the front page of the Daily Planet for the background element and I think that should be fun. I have received some interest in a more in depth explanation of how I do things so I am starting to think about that as well and the best way to present it. I don't really own a camera to put over my shoulder or have the software to record everything I do so I am stuck with the option of doing screen grabs and the hopes of enough written communication to go with it. I guess we will see. BAM! POW!! It's done!! Could not resist starting off this post with the familiar written sound effects. I used to get so annoyed whenever there was a write up in the newspaper or a story on television that was on comics and they would always revert to them even when the story had nothing to do with the classic 1966 show. That brings me to my next point. Why did I suddenly add the "1966" part to the title of the post?? Well, turns out that I have already used The Dynamic Duo as a title a few years back. *Sigh*, I guess it was bound to happen. So here it is in all its glory. I really hope you like it as much as I do. Was really fun to work on and I hope it goes over well. 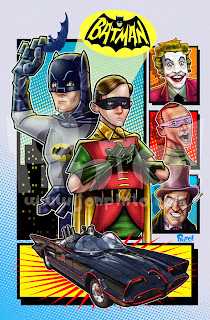 I am a bit disappointed that Adam West and Burt Ward are NOT appearing at the Tampa show I will be at. Oh well, maybe I can still sell a few of them. Did anyone else out there find it hard to believe that the guy training Rocky to fight Apollo Creed used to tangle with Batman? I was blown away when my older brother told me that when we left the movie theater after seeing Rocky way back in the day. Yes. I am old!! So many of you that follow along on Facebook know that the Penguin gave me a bit of a challenge. I was too obsessed with showcasing the big nose that I could not get a pose that worked for my composition. After a night of, well, failure, I decided to not think about the nose at all and let the other iconic paraphernalia work for me instead. After all, he has a purple top hat, a monocle and a cigarette holder to focus on!! Isn't that always the way. Once I did that, it just seemed to draw itself. So I made a picture with the progression of the drawings and you can clearly see my missteps right up front. I also included the full color pic and the value study I also had laying around. Well, I hope you all had your fill of hot dogs and fireworks. While I plug away and try to get the Penguin done, I thought it would be a good time to go ahead and show you the Riddler in all his Frank Gorshin-ness. Is that a word? It should be! You can see the progression from sketch to final. I also, though briefly, toyed with the idea of not putting his mask on because it showed more "face" that way. In the end I decided that without the mask (and since you don't see much costume), he is Frank Gorshin. With the mask, he's The Riddler!